An exciting month for the labees! Jon was awarded The Dumbach Medal for best Chemistry dissertation and The Loyola University Chicago Biomedical and Sciences Dissertation of the Year Award. Noelle was awarded the Babler Scholarship for Fall 2016. Eleanor was awarded the Mulcahy Scholarship and Provost Fellowship for the 2016-17 AY. Marie was awarded the ACS Division of Organic Chemistry Undergraduate Award in Organic Chemistry and is graduating with Departmental Honors (Silver Key). She will return to Loyola for chemistry graduate studies in the fall. Victor was awarded the Professor Cassaretto Medal, the Robert Otremba Scholarship for Spring 2016, and is graduating with Departmental Honors (Gold Key). He will be leaving us to Northwestern's Feinberg School of Medicine in the fall. Click through the banner to see pictures of the event. Congratulations, Jon, for successfully defending! Our paper “Double-Stranded Water on Stepped Platinum Surfaces” was accepted in Physical Review Letters. 62nd AVS in San Jose! Dan, Jon, and Rachael gave contributed talks at the meeting. Jon received an award for being a finalist for the Morton Traum Surface Science Student award. Dan is organizing the “Fundamental Discoveries in Heterogeneous Catalysis” Focus Topic for the 2016 meeting in Nashville. And Rachael got a shirt. Our artwork was selected as the cover for the Nov 2015 issue of Surface Science. Dan and Rachael presented posters at the Dynamics at Surfaces GRC. Rachael was elected to chair the 2017 Gordon Research Seminar. Our paper, “Formation of Surface Oxides and Ag2O Thin Films with Atomic Oxygen on Ag(111)” was accepted by Surface Science. Rachael gave a talk at the regional ACS meeting in Grand Rapids MI. 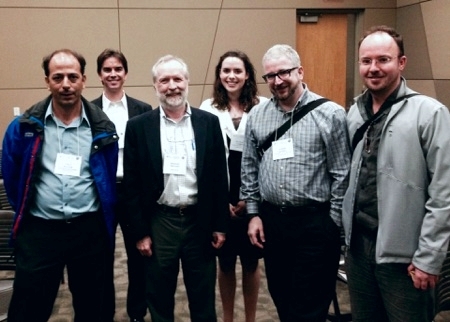 Dan organized a symposium, “Catalysis and Surface Science to Advance Energy Efficiency." Other speakers were Jason Weaver (Florida), Jake Ciszek (LUC), Mike Trenary (UIC), Alex Kandel (Notre Dame), and Charlie Sykes (Tufts). Jon won the 2015 Graduate Student Mentor Award from the Graduate School/LUROP. Congratulations to Dana (left) and Avesh (right) on graduating from Loyola. Department awards: Gabby received the Freshman Fr. Morrissey Medal, Victor the Junior Fr. Morrissey Medal, Marie won the ACS Analytical Award, and Avesh won the Prof. Cassareto Medal. Congratulations! Both Victor and Marie were awarded Provost Fellowships (summer 2015) and Mulcahy Fellowships (AY 2015-16) from LUROP. Our paper, “Combined STM and TPD Study of Rh(111) Under Conditions of High Oxygen Coverage” was accepted by JPCC. Congratulations to Jon! He was awarded the Arthur J. Schmitt Dissertation Fellowship. One of our D2O/Pt(111) images was selected as The January 2015 Image of the Month by RHK Technology. Our PACE STM tip-etching paper is out in JVST A. Welcome to Marie Turano and Gabby Valencia, new undergraduate researchers. We are happy that the ACS-PRF will support our work for the next two years! Congratulations to Melissa and Jon Bender for graduating from Loyola, both with department honors. Jon B. was awarded the Fr. Morrissey Medal for outstanding achievement in scholarship by the Loyola Chemistry Department. Jon was also awarded the Inorganic Chemistry award, Melissa won the Organic chemistry award, and Victor received the Casseretto Scholarship, all from Loyola Chemistry.